Eugene Vorobeychik receives funding from the National Science Foundation, the Department of Defense, and the National Institutes of Health. As states begin to receive millions of federal dollars to secure the 2018 primary and general elections, officials around the country will have to decide how to spend it to best protect the integrity of the democratic process. If voters don’t trust the results, it doesn’t matter whether an election was actually fair or not. Right now, the most visible election integrity effort in the U.S. involves conducting recounts in especially close races. A similar approach could be applied much more broadly. Based on my research into game theory as a way to secure elections, I suggest that the proper first line of defense is auditing results. While an audit can only happen after Election Day, it’s crucial to prepare in advance. Before the election, officials should make clear public statements that they will be auditing the results. But not every district should have an equal chance at being audited. For instance, it may be more difficult to influence vote counts in some districts, such as those with newer voting equipment. Also, attackers may have different goals: They might seek to defeat a particular candidate as a U.S. senator, for instance. Or they might be trying to control the balance of power in the whole Senate, caring more about the overall split than which candidates get elected where. Applying the principles of game theory would let election officials assign each district – from an entire state down to a municipal precinct – a rating combining a range of factors, including how hard a district’s machines are to tamper with, and how much power that district’s outcome has in determining whether a specific candidate is elected, or the exact political split in a legislative body. That rating would determine the likelihood a particular district would have of being audited. For example, if a district had taken special precautions to prevent tampering with its election machines, or was not expected to be a swing district in a broader election, it may be less likely to be audited. Narrowly divided districts that also had vulnerable hardware would be much more likely to be audited, because they would also be more susceptible to tampering. The prospect of audits will in itself deter anyone with malicious intent, reducing the likelihood of an attack. And the audits themselves will help the voting public be sure any tampering is likely to be discovered. For audits to be meaningful, each vote must be recorded on paper – which is much harder to alter than a digital record, and is the only way to have an independent record of votes that can be compared to digital voting results. Ballots can still be tallied using computers, however. 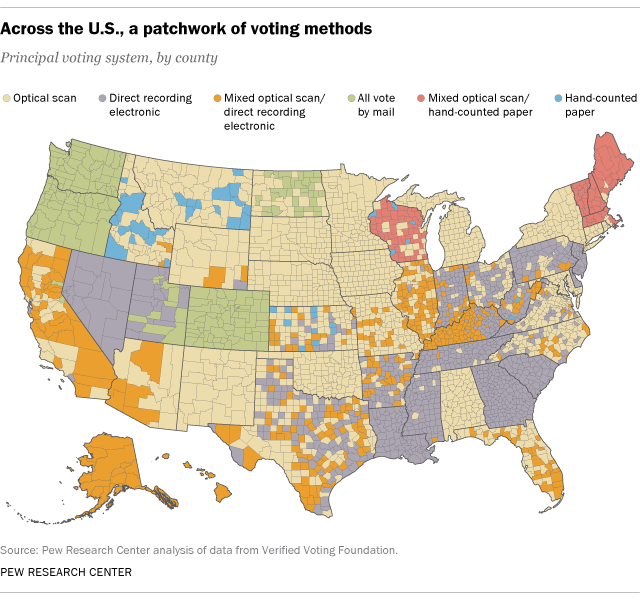 In some districts, voters mark paper ballots and insert them into an optical scanner, which counts the votes and secures the paper records if needed for later examination. In other districts, people select their votes directly on computerized systems. In those cases, election officials should ensure the machine prints out a paper record of how a person is voting, which must be confirmed by the voter before the ballot is officially cast. There are several different mechanisms by which this can happen – such as displaying the paper record through a glass window in the voting machine, and then saving it in a secure compartment for later recounting or auditing. It’s also important for election officials to prepare for problems generating that paper record – whether innocuous inconveniences like printer jams or a malicious attack that disables a machine’s ability to print. This may mean having alternative paper ballots on hand for voters to use if electronic systems break down. Then, after the election, auditors can compare electronic voting results to the results documented in the paper trail. If they don’t agree, then something has gone wrong – either accidentally or as a result of outside interference – and a newly verified tally of the actual paper votes can be used to determine the winner. Often, this is done in the form of a recount for elections with close outcomes. But it needs to happen in other elections too.